This past weekend I ventured to Kazan -- the historic capital of the Kazan Khanate and the center of Tatar culture. To give a really short history: Kazan was captured by Ivan IV (Ivan the Terrible, or more accurately "Ivan Grozny") in 1552. Ivan was expanding and consolidating the rule of the Russian government in Moscow and embarked on a campaign to gain alliances with other Slavic principalities (Tver, Suzdal, Vladimir, etc.) and ventured down the Vulga river to capture Kazan and Astrakhan (1555). Kazan and the Tatar people remained under the control of Russian leaders throughout the Romanov dynasty and into the Soviet period. Tatarstan today is an ethnic administrative republic in the Russian federation (Bashkortostan, where I am, is also an ethnic republic). The Tatars, like Kazakhs, Kyrgyz and Bashkirs, are Turkic peoples. So naturally, I was super excited to go to Kazan. This was a free weekend, so other kids went to. Eleven Americans and seven Russian tutors were Kazan-bound this weekend, so we rented an 18-person bus and off we went! We left Friday around 2 PM and arrived in Kazan 11:30 PM local time. There is a 2-hour time difference between Kazan and Ufa, so we arrived in Kazan 9:30 PM Ufa time, which means we spent a good 7 hours in the car (with only a few stops). While long, the ride gave me an opportunity to witness Russia's green, flat, never-ending territory. Just hours and hours of flat, unoccupied land. Some industry. Then more land. Really incredible. Miles and miles of the flat, green Russian countryside. Portrait bust of Comrade Lenin at a bus stop on the border of Tatarstan and Bashkortostan. 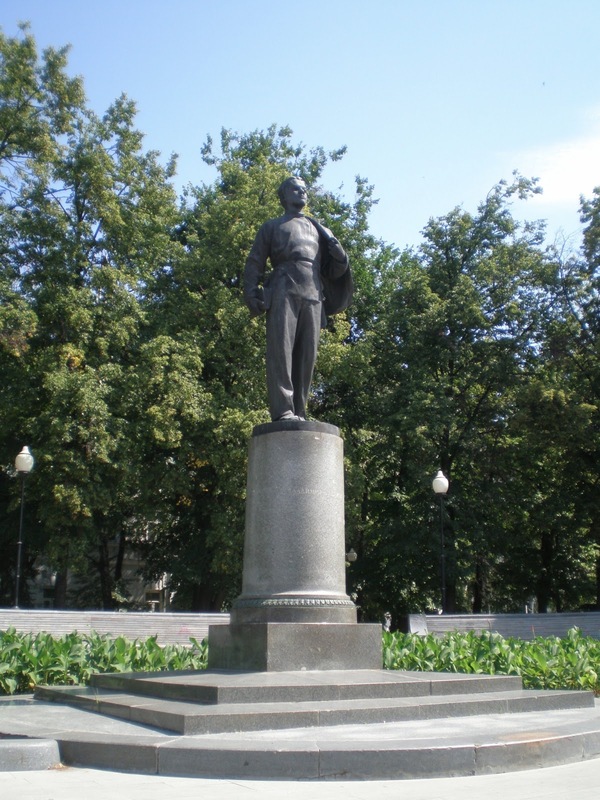 Fact: wherever you go in Russia, there will be a Lenin statue. Rustem, busdriver extraordinaire. Resident of "Chicago" (Chernikovo) and officially one of my new friends. The guy cracked me up. Saturday morning, I was out the door by 8 am, along with four other people. 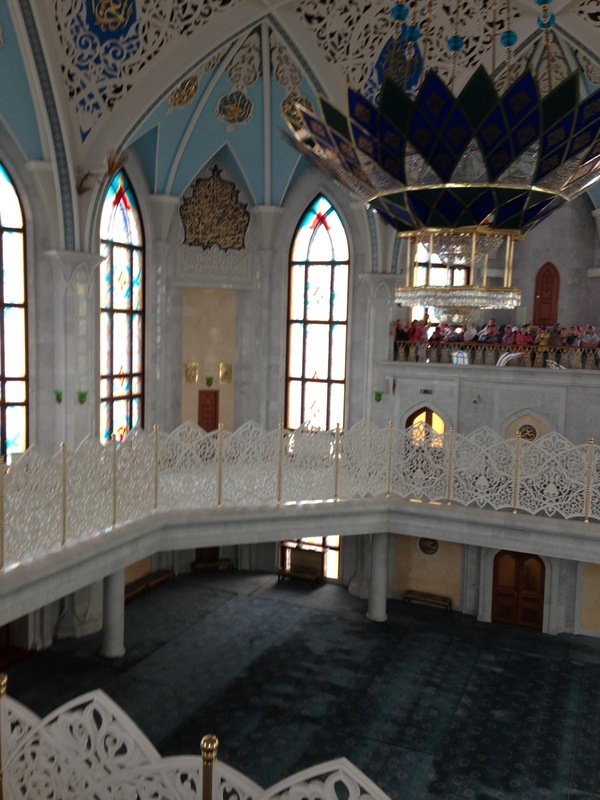 We went on an excursion to the Kazan Kremlin and saw a Mosque and Church. The Kremlin was really interesting, especially since I previously studied the history. The historic center was definitely well-manicured and exuded a European flare. One of the kids on the program told me when he was in Kazan two years ago it was not as pruned. The government has invested in upgrading the tourist facilities for the Kazan olimpiade games. Interior of Mosque in Kazan Kremlin. Capacity is 2500 people. Church in Kazan Kremlin. During the Soviet period, the Church was used as a storage facility for documents. The Presidents Residence in the Kazan Kremlin. Early morning view of Museum (on right) from entrance of the Kremlin. We then walked down one of the main streets, "Bauman Street" and passed Kazan National University, which is where the young Vladimir Lenin studied. There is even a statue of Lenin (a younger, less idealized and more boyish statue). We continued to walk in the direction of a bazaar of which I have heard raving reviews from friends. We didn't end up making it to that bazaar, but went to "old Kazan" which is a less-glamorous district that features older shops and mosques and a BAZAAR (Rynok)!! I have been craving a rynok, because everyone in Ufa says "we do not have rynoks, they've been converted into "torgovnie tsentrs" (trade centers...basically malls)...you should have come in the 1990s." I do not buy that argument -- given the large numbers of migrant workers and the average income of pensioners and those laborers, and the fact that 29% of the Russian population makes less than $315 a month, according to a 2012 article by Mark Adomanis -- the complete annihilation of rynoks is mathematically impossible. Rynoks are a major source of self-employment with low barriers to entry and offer very cheap goods. Torgovli tsentrs are much more expensive. Plus, in the summer, many Russians rely on their dachas and personal gardens for produce. Construction of new stalls in Rynok in the "Old Kazan" section of city. Anyways, the Kazan rynok was awesome. I was particularly impressed by two features: first, I noticed a sign above two separate fur-coat vendors that said "we accept credit" with the sign for a Russian bank. I wasn't able to get a picture, but this is unheard of -- a credit card in a rynok!?! This is really impressive and shows that (a) consumers need credit to buy goods (b) rynok vendors are attempting to satisfy consumer demands (c) the rynok vendors qualify for a relationship with a bank and can handle credit-card transactions, i.e. they have legitimate businesses -- not just rinky-dinky stands. What we see here is the transition from an informal bazaar structure to a more formal "torgovnie tsentr" model. That is really cool. Second, new stalls were being added to the rynok. These were not just containers, but a new type of construction I have not yet encountered. Usually there are some containers in between rows of vendors, where goods are stored and easily accessible (lets say if a vendor needs to get a different size dress for a customer). But here, these are thin walls without storage space (containers). And all of the bazaar vendors were super friendly --- one Azerbaijani vendor who moved to Kazan during the 1990s to flee the war even gave my friend two complementary oranges as a gift. We bought some dried fruit and awesome fruit-chocolate-nut trail mix from this one store that specialized in near-east products. 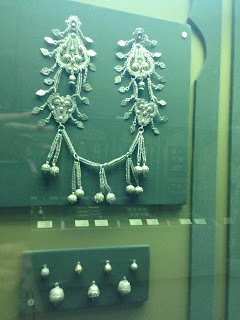 Then we went to the national museum of Tatarstan. The museum was very well done and had a great collection of Golden Horde items. My one critique, however, is that the museum details Andronovo culture and the rise of the Kazakh khanate and the Golden horde, and then jumps to Catherine, skipping over entirely the rise of Moscow, the founding of the Russian government in Moscow under Ivan III, and solidification of the government's power under Ivan IV. There is also no history of temporary alliances between different Turkic and Mongol khanates along with Russian principalities. Basically half the story of Tatarstan's history is missing. 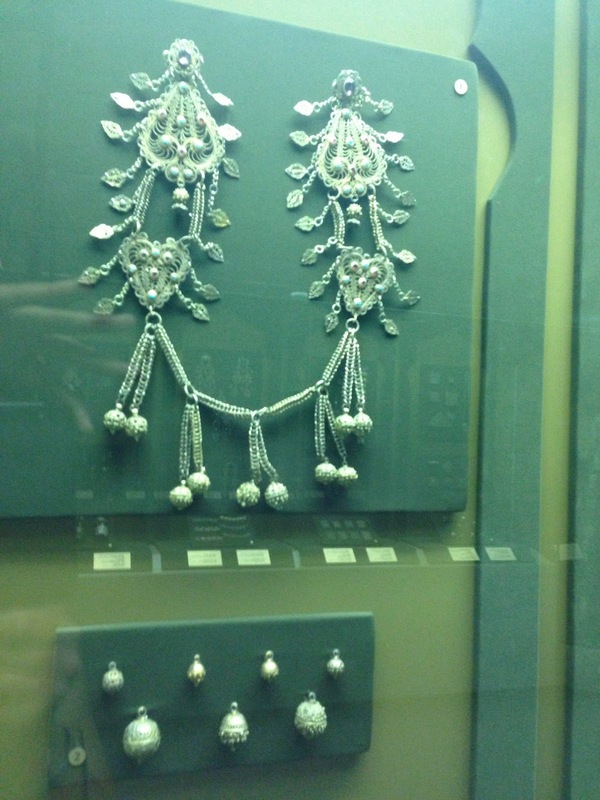 But the material on Tatar folk attire and Catherine was very comprehensive. A traditional Tatar dress. However, the print is extremely Uzbek in style. Finally, the day ended with a basketball match -- the Olimpiada!! I'm not a huge sports fan, but sine I'm a Hoya and I was in Kazan during a major sporting event, why not? So I went to the U.S. versus Australia girls basketball game with two other friends. U.S. won 79-78 -- it was a really close game. The final basketball game is tonight (Monday) between the U.S. and Russia. As much as I love Russia, I will of course be rooting for the USA tonight! This game also wins the prize for most interesting half-time show. Bikers. Final scoreboard -- so close!! Team tents. Notice "Almaty 2017" -- Kazakhstan is bidding to host the games. Location of 2017 games to be announced in November ! After the game, we spotted three sets of American parents. We went up to them and introduced ourselves as Americans who came to support our fellow Americans. They were SO THRILLED to hear English, see other Americans and have normal communication (since they don't speak Russian and don't know the culture too well). We were exhausted by the end of the game, went home and slept. Sunday morning we walked around the city some more, before heading out for an 8-9 hour drive (Sunday traffic returning from dacha). All in all, was a great, albeit exhausting trip. Now back to studying.